Nippi Owners' Club FAQs: Making sense of the new licence. If you have a full driving licence for a car that was issued before 1 February 2001 you don't need to do anything as your licence when issued also included all motorcycles, scooters and Tricycles. Go ahead Enjoy! But be careful if you are a newbie ... Just because you are legal doesn't mean you know everything about riding, it still takes time to learn and in fact it could be said that while you don't need a CBT, it might be worth thing about, just for the experience. Since January 19 2013 the law has changed and it affects everyone who had the licence issued after 1 February 2001 as the previous category (B1) was abolished. 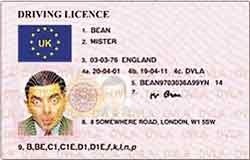 (I will explain later what happens if you have an old B1 licence). You can then ride a Nippi or Trippi as an A1 MOTORCYCLE for 2 Years on L plates, but within that two year year period you must apply for (& pass) Compulsory basic training (aka CBT) either as an A1 or A2 Category. After 2 Years your provisional will expire if you don't pass a CBT. Update August 2014: Some owners riding 50cc Trippis have reported that they have had no problem continuing to ride on L plates well past the two year probation / expiration. Do this at your own risk! If in doubt contact the DVLA. Riding with the incorrect licence could invalidate your insurance and you may be prosecuted. Also please note despite the possibility mentioned above, many insurers are now requiring owners to take the A1 Theory before offering insurance. So the advice is if in doubt you could be better off at least sitting the A1 Theory. The CBT for trikes is slightly different than for motorcycles in that it involves less manoeuvring / wider cones and stuff like that to allow for a bigger machine. Another important difference is the result, if you take the test on a trike (or Nippi or Trippi) your new licence will only allow you to ride a Trike. Also If you take a A1 CBT you will only ever be able to ride trikes of the A1 category. If in the future you think you are going to want to move on to a different sort of trike over 125cc (over 11KW output) you will have to take a new A2 test. Unfortunately because the Nippi and Trippi are both A1 category Trikes its not possible (I don't think) to take an A2 CBT on one. Again: Take a A1 CBT on a Trike and you can only ride Trikes and then no more 125cc. The first and most important think to note is this only applies if you have a recognised disability that was pre-existing before January 2013. "The B1 category of licence is to be scrapped. A disabled person riding a Trike on a provisional car licence before January 19th will have to apply for a provisional motorcycle licence and do a CBT course after the 19th before they can ride on the road again. A disabled person taking a test on a Trike will qualify for a licence restricted to Trikes. It will not qualify them to ride solo motorcycles or drive cars." If you passed a CBT before 19 January 2013 you need do nothing, however if you want to upgrade to something else over 125cc you will need to take a new CBT A2. If you find anything wrong with this information don't shout angrily, just let me know and I will update it!